11/8/2013Share this story on Facebook! Every year since freshman year, I have gone to the Commons in downtown Ithaca on the first day of Apple Harvest Festival. It takes place right near IC, and students can even take the bus that leaves right from campus, or they can walk downtown to partake in the annual festival. Known as Applefest to the locals, this event is full of local produce; from tasty apple beverages to hot apple cider donuts that you can smell a mile away. As you walk by the different food vendors lined up on the street, you can overhear them explaining how they make everything. One of my favorite things is the Amish baked goods: homemade apple turnovers, banana bread, and pumpkin pie piled high on folding tables, served by local Amish people. I always look forward to visiting their table and seeing what new delicious goods they have. They’re all homemade and very affordable. Aside from the food items along the corridors, there are several stages downtown set up for live music performances. Several of IC’s student organizations and media groups traditionally serve as entertainers during the three-day event. During this year’s event, there were performances from Second Dam, a rock band made up of Ithaca College students; IC Voicestream, the co-ed a cappella group; Premium Blend, the all-female a cappella group; and the IC Circus Club. All groups featured a range of songs from Lady Gaga to Katy Perry to Daft Punk, to name a few. WICB, IC’s award-winning FM radio station that serves Tompkins County, was also present. There were also local crafts for sale. This year, Applefest featured unique pieces of jewelry and clothing, such as bracelets made of silverware, bohemian-style dresses, and intricate paintings of landscapes. 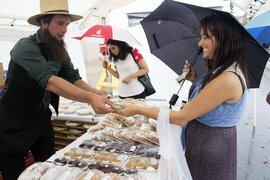 This year, local artists displayed one-of-a-kind pieces of jewelry, ceramics, home decor, body care, specialty gifts, and unique sculpture. There’s something special about indulging in your favorite pumpkin funnel cake, listening to live music, and shopping for unique art pieces with your friends that makes for a majestic fall weekend.